World demand for food containers is forecast to rise 4.5 percent annually to $139 billion in 2017. While the US remains by far the world’s largest user of food containers, the most significant growth will occur in India and China. Bags and pouches will remain the largest category based on their light weight, portability and convenience. 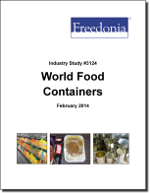 This study analyzes the $111.4 billion world food container industry. It presents historical demand data for 2002, 2007 and 2012, with forecasts for 2017 and 2022 by product (e.g., bags and pouches, paperboard containers, plastic containers, metal containers, glass containers), market (e.g., grain mill products, dairy products, fruits and vegetables, baked goods, meat products), world region, and for 22 countries. The study also considers market environment factors, details industry structure, evaluates company market share and profiles 41 industry players, including Bemis, Ardagh Group and Silgan Holdings.